Modern Life: Healthier. Easier. More fun! My super interesting interview with former U.S. Track and Field star turned oral care entrepreneur, Perry Fields. She talks about her very interesting and windy path to entrepreneurship which all started when she had to figure out how to heal herself from an almost fatal illness. Find links and show rundowns at AlegreRamos.com/podcast Become a patron and check out my cool thank you gifts at patreon.com/AlegreRamos Want to stay up to date on everything? Follow me at SmartURL.it/FollowAlegre and I'll gift you "11 Things That Make My Life Easier and Healthier" as well as my DIY Taco Seasoning. A few minutes reflection on letting go and welcoming the new year with open arms. Find links and show rundowns at AlegreRamos.com/podcast Become a patron and check out my cool thank you gifts at patreon.com/AlegreRamos Want to stay up to date on everything? Follow me at SmartURL.it/FollowAlegre and I'll gift you "11 Things That Make My Life Easier and Healthier" as well as my DIY Taco Seasoning. A few fun recipes for gift giving no matter what time of the year it is! Snowball cookies, Crusty bread, and Gingerbread for cookies or houses. Find links and show rundowns at AlegreRamos.com/podcast Become a patron and check out my cool thank you gifts at patreon.com/AlegreRamos Want to stay up to date on everything? Follow me at SmartURL.it/FollowAlegre and I'll gift you "11 Things That Make My Life Easier and Healthier" as well as my DIY Taco Seasoning. Welcome to “Season 2” of my podcast. I'm making some changes, and I'd love to hear what you think of them. Then I'll give you a tip for making the holidays more fun AND less stressful, and talk about how I'm gearing up to make 2019 "my best year ever" (I strive to make every year "my best year ever"). Find links and show rundowns at AlegreRamos.com/podcast Become a patron and check out my cool thank you gifts at patreon.com/AlegreRamos Want to stay up to date on everything? Follow me at SmartURL.it/FollowAlegre and I'll gift you "11 Things That Make My Life Easier and Healthier" as well as my DIY Taco Seasoning. The case for politeness. My conversation with my friend Angela, who is in search of her professional passion after 20 years with one employer. And a fun and easy tip for eating healthier in spring. 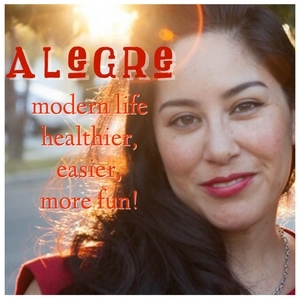 Become a patron at patreon.com/AlegreRamos and check out my cooking webinars at AlegreRamos.teachable.com Thanks for listening! Listen to why I think life is like a lemonade stand! Then you’ll meet my friend, mom, HR-professional extraordinaire Christine Keegan. Then I’ll give you a quick, seasonal health tip. Become a patron at patreon.com/AlegreRamos and check out my awesome thanks you gifts. My #1 tip for creating lasting change in your life. I answer a couple of questions. Then I share a fun, easy way to meaningfully close out 2017 and enter the new year with added momentum. A bit about my name, the new year and Momentum, an interview with award-winning documentary filmmaker Jeff Springer about staying motivated on long-term projects, and 2 tips to make the holidays season easier and more fun! Becoming a patron at patreon.com/alegreramos and get my New Year Checklist--to help you gain momentum--at SmartURL.it/NewYearChecklist SUBSCRIBE to my podcast and submit questions to hello@alegreramosDOTcom. New podcast every Tuesday. Enter the New Year with Excitement and Momentum • See you next time!